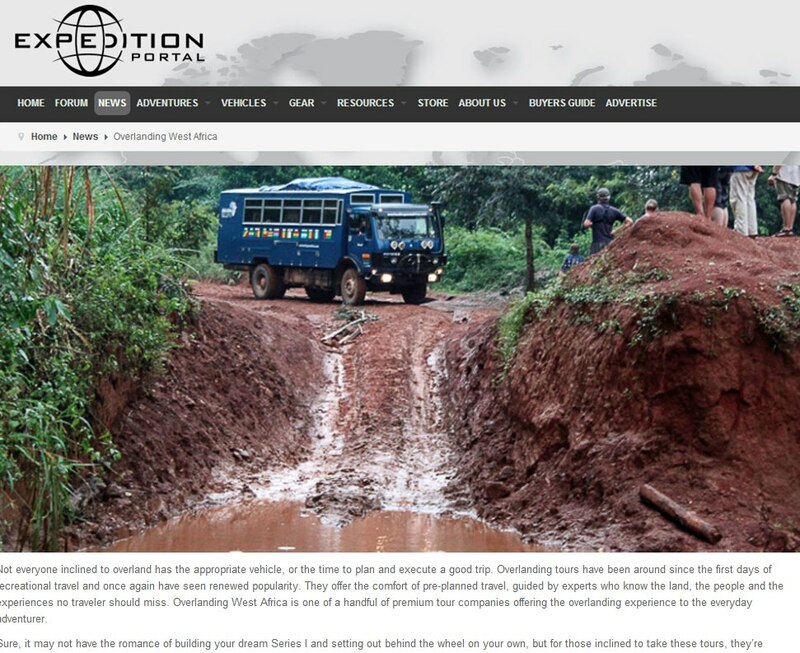 The first ever overland truck trip through Liberia! What a hectic few months it has been since we last wrote a post for the website! Finally we have the time to sit down and put pen to paper (or fingers to keyboard) and fill you in about what’s been happening at Overlanding West Africa. See what the sign says below? 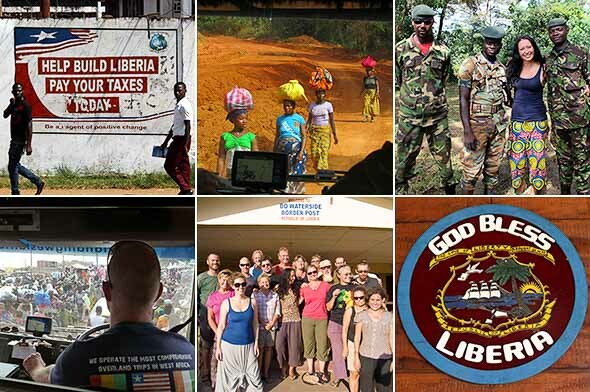 THEY’RE IN LIBERIA! Overlanding West Africa are proud to be the first ever overland truck based company to run a trip through the country. 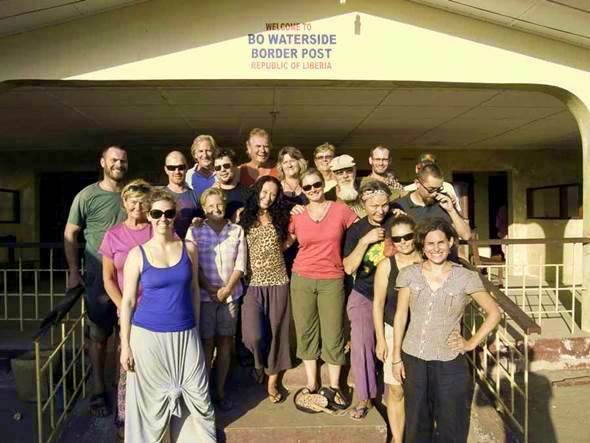 Here’s a picture of Al, Nev, and the group as they crossed the border from Sierra Leone a few days ago. Al says the drive from the east of Sierra Leone into Liberia was a long hard slog, the roads were terrible, and it took longer than expected, but in the true nature of overland adventure travel they made it! 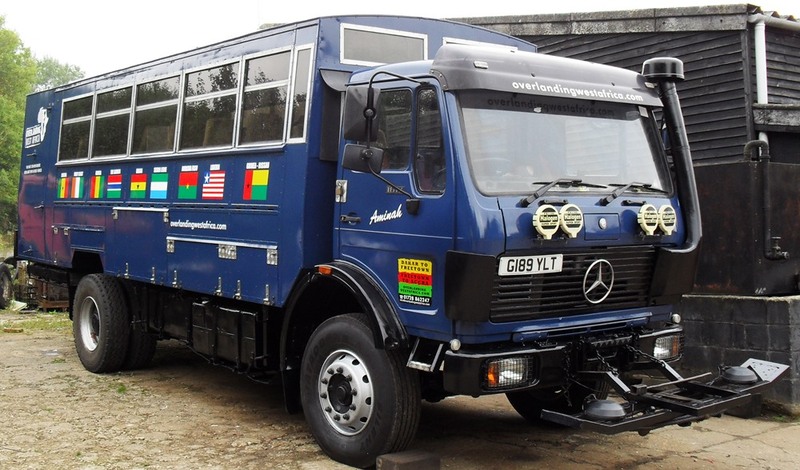 Another first for Overlanding West Africa after being the first ever overland truck based company to run trips in Guinea Bissau and Sierra Leone in 2012. Well done Al, Nev, Aminah, and all the group, congratulations! Well, what else has been happening over the past few months? After our hugely successful first season, Hatter has settled in the UK permanently to focus upon the operations and marketting for Overlanding West Africa and working to build upon the success of the first few years. Jimmy has decided to move to Australia to focus upon a new business venture and to settle down with his partner Claire. To enable the trips to keep running, Hatter and Jimmy invited Al Goodridge to buy some shares in Overlanding West Africa and act as the new director, and Al is currently leading our trips in 2013 and 2014 with ex-Oasis Overland driver Nev Kelly. After a full mechanical overhaul, restocking her supplies and spare parts, and passing her MOT, Hatter and Al drove her down to the south of Spain. Upon arrival, Nev flew in to take over from Hatter, and off they went across the straits of Gibraltar to Morocco for the long drive to Dakar. As those of you who follow us through social media will know, our Dakar to Freetown trip is now well underway. The group are currently in the beautiful Casamance region of Senegal enjoying a couple of nights on the Atlantic coastline. Al, Nev and Aminah left Dakar with a group of 19 overlanders: A warm welcome to John, Ant, Narelle, Sascha, Phil, John, Arnold (Will), Warren, Jane, Robert, Connor, Chris, Daniel, Ian, Peter, Ina, Janet, Birgit and Tania. You can expect regular updates from Al and the group as they make their way down to Ghana over the next 10 weeks or so. A real highlight of the trip so far was the groups visit to Abene in northern Casamance. Al and Nev took the group to a wonderful campement managed by Simon for an evening of traditional music and dance. 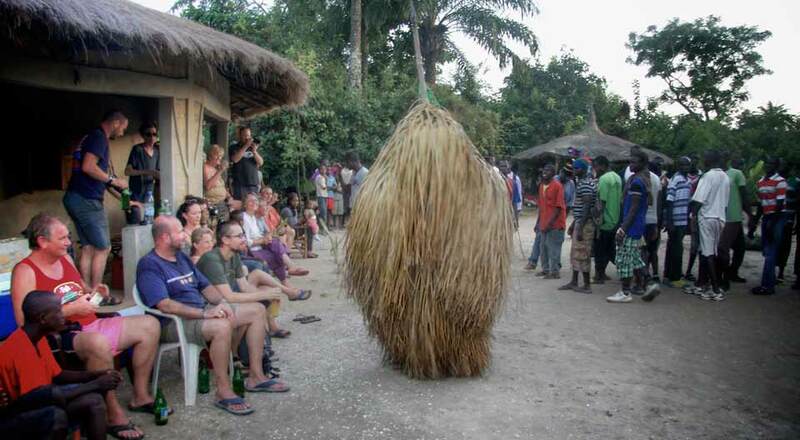 The climax of the festivities was witnessing a ‘Koumpo’ (known as a forest spirit) whip up a frenzy on the dancefloor, a real privilege to see. A massive thank you to Simon, the staff at the campement, and all the performers for such a wonderful evening of entertainment. Back here in the UK, World Travel Market took place at London’s Excel Arena this week. Hatter popped along for the day to visit those stands representing West Africa. Gambia, Ghana, Sierra Leone, and Nigeria were all present, and it was great to put some names to faces after so many years. We want to say a massive thank you to Ola at ‘Come To West Africa’ magazine for including Overlanding West Africa in the latest edition. 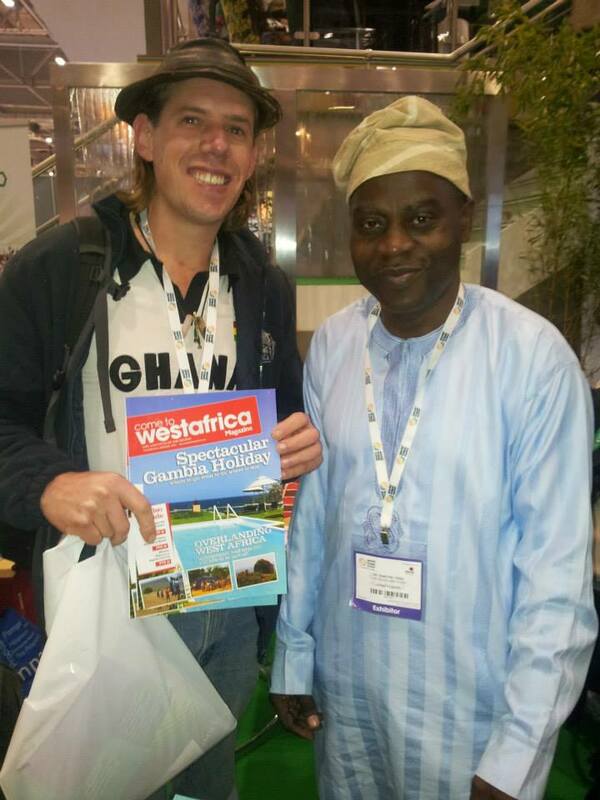 Ola was working at the Nigeria stand at WTM helping push the West Africa tourism message, and Hatter was lucky enough to grab a photo opportunity with the editor himself! Not only is Overlanding West Africa on the front cover with 3 photos, but there is an 8 page feature inside talking about what we are trying to achieve with our trips. Thanks so much for including us Ola we really appreciate it! Also many thanks to ex OWA passengers Rob Kuhlman, Inga Lotta, Wilna Wilkinson, Holly Melanson, and Clare Glade Wright for some of the superb photos used in the article. Also a big thank you to Christophe Noel for writing a review about us for the superb Overlanders website Expedition Portal. Christophe highlights the fact that our trips go as far off the beaten track as possible and to places well of the radar for most travellers. Thanks Christophe! Remember, you’ll need to book quite soon if you want to take the last available seat on our Accra To Freetown trip in January 2014. We also have just 3 seats left on our Freetown To Dakar trip starting in March 2014. If you can’t join us this season, we will have new dates for our trips in late 2014/early 2015 on our website by January 2014 so keep checking in! We hope you all have a very happy Christmas wherever you are in the world, and a very happy new year. We hope to see some of you onboard Aminah in 2014 for another incredible adventure through West Africa!